I find the picture book world vast and intimidating – do you? It seems as though at least fifty new picture books are released each week. Only the strong could survive such an onslaught (not me, I am not that hardy)! Still, I need to keep up a bit, if only so that I have new titles to recommend to friends and gift to the littles in my life. 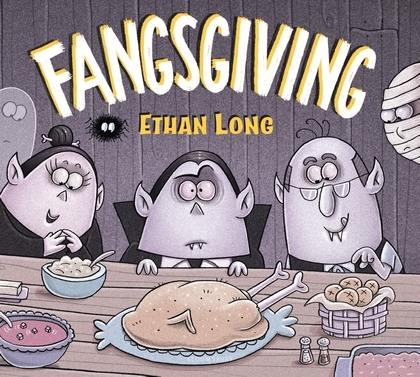 Ethan Long’s Fangsgiving is a fun monster-mash of a Thanksgiving book that will be a hit year-round, but especially during the autumn months. It's the fourth Thursday of November, and the members of Fright Club are cooking up something spooky… a Thanksgiving feast! But when Vlad's family arrives unexpectedly, they put their own spin on each of the dishes. Now, the rolls are as hard as headstones and the turkey has been cooked to death. Vlad loves his family, but they've made a mess of their meal! Can this monster-filled family come together to save their feast and celebrate what the holiday is truly about? Did you know that monsters celebrate Thanksgiving too? Vlad the vampire and his friends (a werewolf, a mummy, a ghost, and a witch!) are getting together for the holiday in Vlad’s treehouse. They’re nearly ready to sit down to eat when… Vlad’s whole vampire clan descends! Vlad’s family have their own ideas about what food looks good – from lump-kin pie with maggot meatballs to completely charred turkey. Will Vlad have a meltdown and kick out his family? In the end family and friends combine efforts to prepare and celebrate a Thanksgiving (Fangsgiving) worthy of the name. The art is a huge highlight, with appealing nighttime scenes (they’re creatures who go bump in the night, after all!) done in dark purples (graphite pencil, colored digitally), funny sequences rendered with care, and fantastic details (like skull-printed potholders) on each page. Long gives every character googly eyes – even the spider hanging from the ceiling, and this only adds to the enjoyment. With monster-ific food prep depicted on almost every page, kids should have plenty of questions and opinions to share, especially about the vampire family’s idea of cuisine. 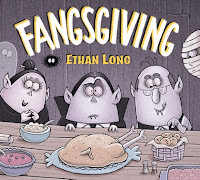 In all, Fangsgiving is a cute, lighthearted holiday tie-in picture book that will delight readers young and old, especially at group storytimes in October and November. Recommended for: children ages 5-7, and for classroom, library, and bookshop storytimes.